Relate the ancient technologies in this lesson to modern technologies. Give an example of a modern-day technology that originated from one of these ancient technologies. Prepare the Roller Sledge cards. Collect all the materials and place them at the station. Tie the rope to the palette securely at two corners so that there is a loop about 4-6 feet long for students to pull the sledge. Cook wheat berries for tasting. Collect all the materials and arrange them on a table. Make an elevated sandbox at a slight slant. Connect the hose to the sandbox. Welcome students and introduce this history walk, which is about ancient technologies. Tell students that they will rotate through three stations to learn about different types of ancient technologies from all over the world. Point out each station and make sure students can see the set-up materials, but don’t name them or explain what they are. Investigate connections between ancient and modern technologies and introduce today’s stations. Invite students to share the ancient civilizations they have already learned about in their classroom. Ask them if they think any of those civilizations will be represented today on the Ancient Technologies Walk, and what they think they will be doing at each one. Introduce each station and briefly describe what will happen there. Irrigation station: Students will explore the technologies of dams, levees, canals, and reservoirs using an elevated sand tray with a river running through it. Grain grinding station: Students will thresh, winnow, and grind wheat or barley. Roller sledge station: Students will demonstrate using an ancient tool that makes work more efficient. Ask students to think about modern-day technologies that may have derived from the ancient technologies they will learn about in the walk. Divide students into three groups and rotate the groups through each station. Ask students when the Egyptians built the pyramids. Prompt students to think about how we know information about civilizations that lived four to five thousand years ago. Show students the cards of workers building the pyramids using the roller sledge technique and invite them to share their observations. The Great Pyramid is outside of Cairo. It was built with 2.3 million stones. The average stone weighed 2.5 tons or the equivalent of an SUV. Some stones weighed as much as 16 tons or the equivalent of two full-grown elephants. The great pyramid is 1½ football fields tall and 2½ football fields wide. It took 10-20 years to build under pharaoh Khufu. Explain that today’s challenge is to move very heavy “rocks” from one location to another as a team using the roller sledge. Assign students roles: pullers, wooden pole movers, and rocks (a nonspeaking part). Rocks should always be in a sitting position with hands and feet away from the edge. Polers should always wait until the pole is completely released before reaching for it. Ask the students to put on gloves and set up the roller sledge by placing half the poles parallel on the ground, roughly two feet apart, and placing the pallet on top. Ask the rocks to get on board and tell the pullers to pull slow and steady, making sure to give the pole movers enough time to move each pole from the back to the front as the pallet moves forward. Pole movers will have the remaining poles in hand at the ready. Once they have completed a successful test run, ask students if they’re up for the challenge of putting more weight on the pallet and going up hill. When they accept the challenge, take all supplies to the bottom of the hill and begin the process again. Give students the option of switching roles at this time. Remind students that they are moving hundreds of pounds of weight up hill without motors or wheels! Increase the challenge if time permits (up a steeper hill, a longer distance, more weight, fewer pullers). When time is up, send students to the Irrigation Station. Using a globe, ask students to find modern-day Mesopotamia and to describe the climate and landscape of the region. Prompt students to think about the challenges of living where there are periods of drought and periods of flooding. Define reservoir, levee, dam, and canal. Compare the landscape in the elevated sandbox to Mesopotamia. Give each student a plot to irrigate in the sandbox. Explain that each student is responsible for creating a system of irrigation that will move water from the main river to their plot using reservoirs, canals, dams, and levees. Tell students they need to allow water to flow to communities downstream. Give each student one trowel and one wooden block. Ask them to imagine that they are ancient Sumerians. Re-create a flood scenario with storytelling and water flowing through the hose into the sandbox. Give the students an opportunity to assess their irrigation system, make improvements and try again. Then ask students to discuss the improvements they made. When time is up, send students to the Grain Grinding Station. Ask students what a staple crop is, and ask them to give examples from around the world. Explain that wheat was one of the staple crops in Ancient Egypt. Show students the card with an image of a harvester, and ask them to describe what they see. Explain that in the image the person is harvesting and threshing grain. Hold up an example of a wheat stalk and ask if students know how wheat turns into bread. Tell students that in this station they will process grains in three different ways. 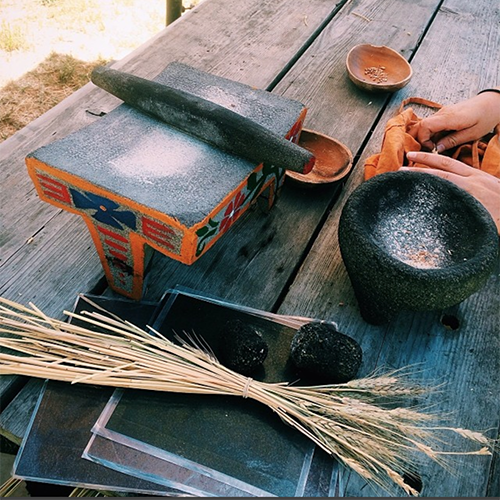 Show students the card with an image of someone using the mortar and pestle, and ask them to describe what they see. Explain that the person in the image is grinding grain. Explain that today students will be using the mortar and pestle to grind wheat berries into flour. Invite students to taste the cooked wheat berries. Ask a student to demonstrate using the mortar and pestle, reminding them to be gentle. Ask a student to demonstrate using the bag method to thresh, and how to use your breath to winnow. Explain that you will be choosing students two at a time to ride the grain-grinding bicycle. Divide students into three groups and have them rotate through all three substations of the Grain Grinding Station. When time is up, send students to the Roller Sledge Station. Lead students in a brainstorm of the discussed technologies from the history walk. Ask students to use the Think-Pair-Share process to reflect on today’s lesson. Think: Give students an interesting broad question to think or write about briefly. Pair: Pair students, and ask them to discuss the question(s) with their partner. Share: Students share their discussion ideas with another pair of students or the instructor leads a whole group discussion about the topic. Ask students to choose one of the stated technologies, turn to a neighbor, and connect it to a modern-day technology. Invite students to share what they discussed with their partner with the group. Students analyze the geographic, political, economic, religious, and social structures of the early civilizations of Mesopotamia, Egypt and Kush. Apply scientific ideas or principles to design an object, system, process or tool. Edible Schoolyard students and teachers use observation and awareness to explore, investigate and be inquisitive learners in the garden. The garden classroom provides the opportunity for students to tap into their inherent curiosity about the natural world, observe patterns and connections and understand cause and effect. Acknowledge water as a precious resource that is intrinsic to all living organisms, explore methods of water conservation, and are encouraged to do the same in their own lives as well.